Each week Jake proposes a theme for creative inspiration. You can post your interpretation to the theme on your blog anytime before the following Sunday. Remember to post your link in the comments section of the weekly challenge. Here is my entry for nature. This photo was taken in Honduras right outside the Pico Bonito National Park, which is a rainforest. 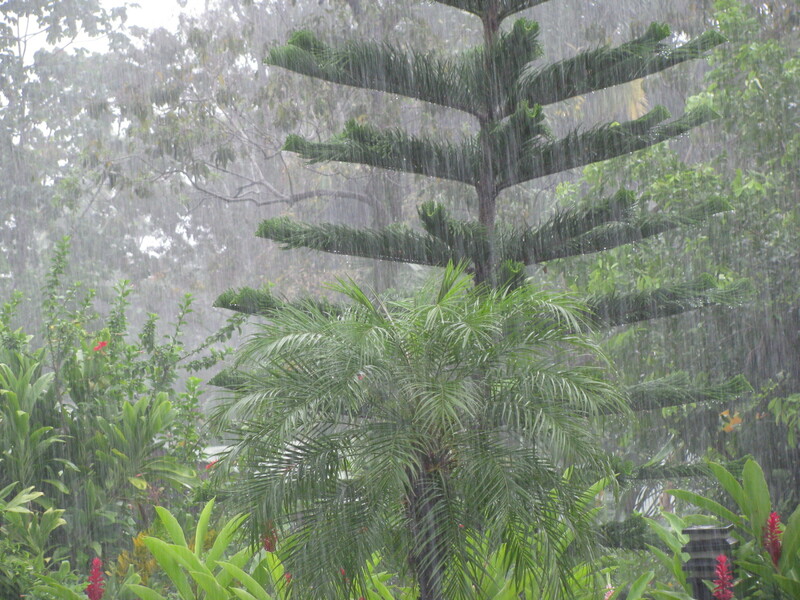 This was my first experience of a downpour in a rainforest. We were sitting outside by the pool and then all of a sudden the skies opened up and the rain started pouring. It was an amazing experience. It only lasted for a few minutes. This entry was posted in Travel and tagged Honduras, Nature, Nature Photography, Photography, Photos, Pico Bonito National Park, rainforest, Sunday Post. Bookmark the permalink. Great picture, you can really see that torrential downpour. I imagine the earth smelled great afterwards too. Yes! I love that smell. I admire nature every day. It is wonderful! Don’t think me weird – but I love that picture! It’s fascinating how so much can pour down and then ten minutes later its absorbed, moist and lush! It is amazing and something to see. The photo has a mystical quality to it. Wow! I am sure you got soaked through. I was soaked most of my time there, with the rain, the humidity, and the pool. But seriously, I can’t complain since it was one of the best trips. It was…and the plants loved it! That’s such an awesome photo how you can see the rain come down. Beautiful. Absolutely wonderful for this week’s theme!!! Thanks Cee…It was the first thing that popped into my head. Great capture of the rain. It’s like the saying, “raining cats and dogs!” I experienced something similar in Puerto Rico. It was the hardest rainstorm I had seen at that time. I saw it rain harder in Boston once and that shocked the heck out of me…however it was during a hurricane so maybe it shouldn’t have surprised me 🙂 I enjoyed the rain more in Honduras though. Rainforests are amazing places…we all need to support those who are trying to preserve them. Your photo is quite mystical…like looking through a veil of mist. A veil of mist…I love the way you put it! Wow, that is a downpour.. you captured the mood of the rain, I can almost hear it. There is something so peaceful about the rain… nice. I love watching it rain…I could watch it for hours. I think it has a power over me. This is interesting…I want to join if the theme is perfect to one of my turtles photos. Your turtles would be awesome for the theme! Nice of you to capture the rains. Beautiful. Thanks! It was a sight to see and to feel. Wow, look at that, it really is sheets… lovely shot.